Over a year ago I started working with Red5 which ultimately caused me to have to learn Flash development as well. If you are new to Red5 and new to Flash, its possible you will find this tutorial extremely frustrating as I probably would have a year ago. 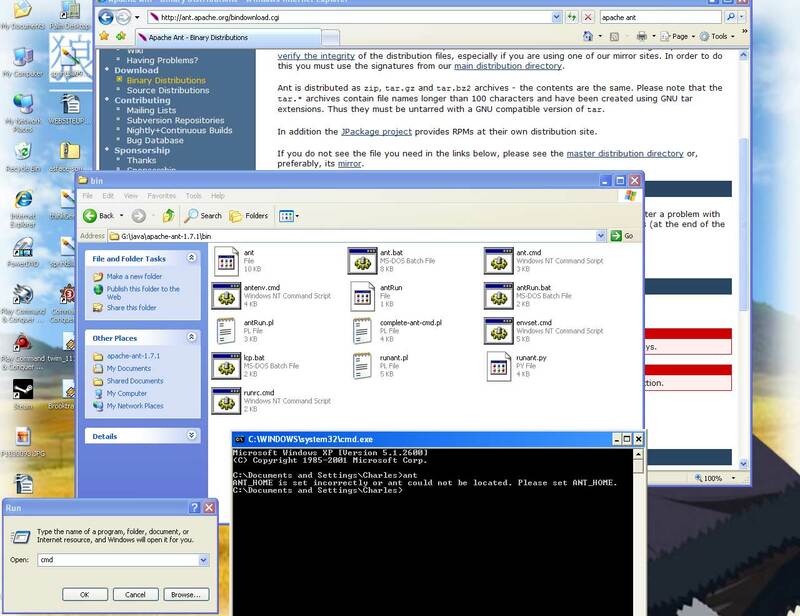 Your best bet of getting started with red5 is the flashextensions video tutorials. I understand that all the acronyms that come along with Java and flash are frustrating when trying to learn. Just stick with it, and you'll be a proffessional before you know it. Red5 runs and is built on Java, the first step of setting up a development environment is getting the latest Java Development Kit. Java is notorious for using confusing acronyms in their product names. Currently the Java Development Kit goes by Java SE Development Kit. 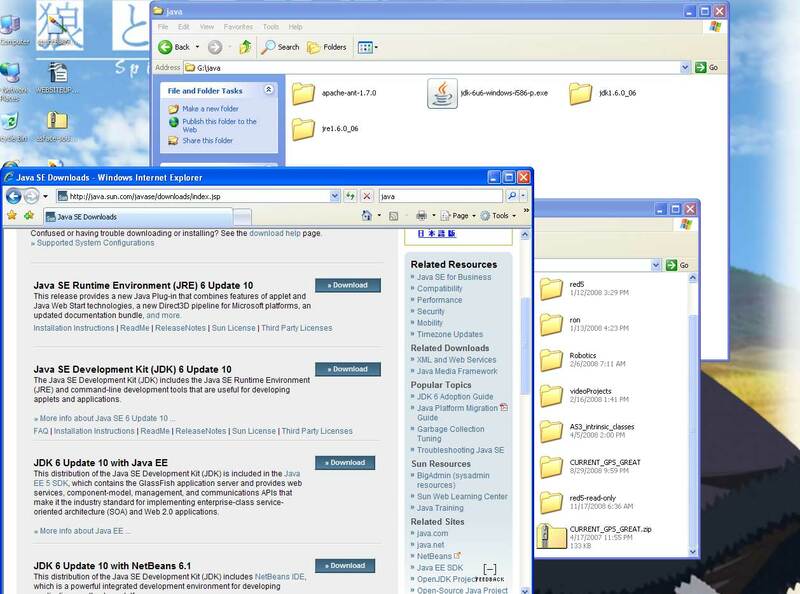 Just look for the download that contains the words "Development Kit" You can install the Java Development Kit (JDK) wherever you want, but you will need to know the exact path to the installation folder in later steps. I had an old version of the JDK on my computer, so I un-installed it and started with the newest version. This is the question I asked when I first had to use this tool. 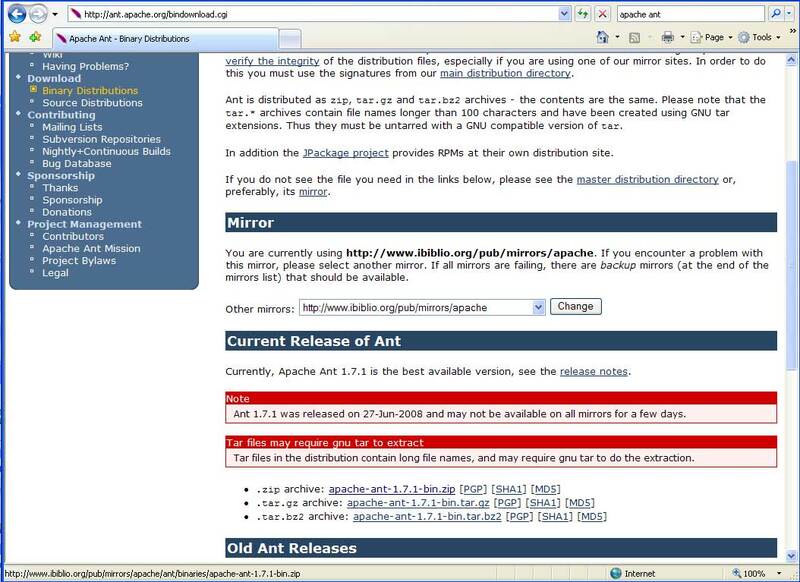 Apache Ant is a build tool for Java applications. 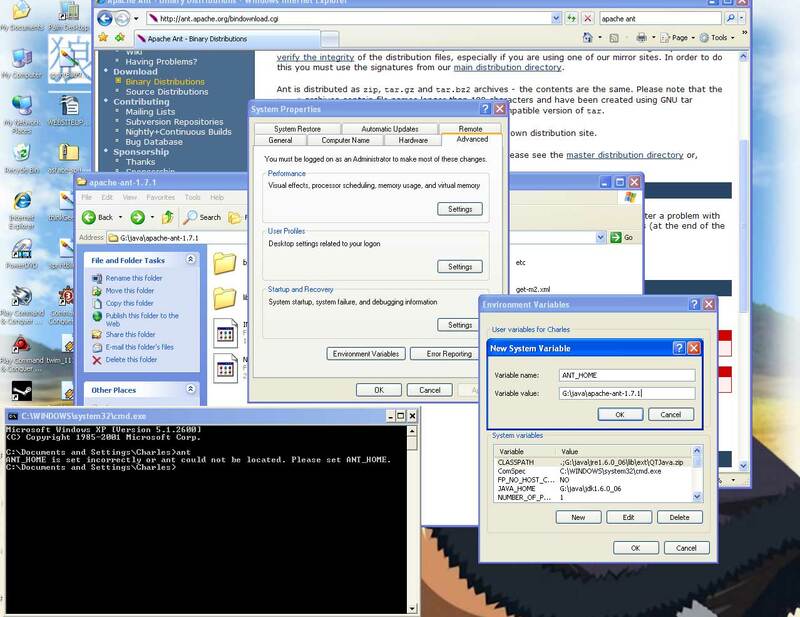 It basically allows several java applications to be compiled at once. Its like a Windows batch script or a C++ makefile. The method of development with Red5 that I am showing uses Apache Ant in order to build the server and its associated applications using only one command and a build script. When you go to the Ant website, get the .zip version of Ant and simply unzip it to a place on your hard drive. Just like the JDK, you need to know the exact path to Ant and specifically its bin directory. Just like Java, Ant also requires Environment Variables to be set in order to ensure proper operation. Ant requires two variables. Just like Java, under the System variables section in Environment Variables, you should create a New variable. This time give it the Variable name "ANT_HOME" and a value of the directory it is installed (unzipped) in. The second modification for ant is to add its bin directory to the "Path" System variable. If you scroll down under the "System variables" section you will see a variable named "Path" click on it and click "Edit". For Variable value, you will see several operating system directory paths separated by semicolons. You need to add the path to ants bin folder to this list. In order to make sure that we have installed the Java JDK and Ant correctly, open a command prompt window by going to start, run, and type cmd. In the command prompt window first type "java" and you should see a whole bunch of usage parameters get listed. This means Java is installed correctly. The next thing to type is "ant". You should see some dialog like "build.xml does not exist". This means ant is installed properly as well. If for some reason, the java or ant commands aren't responding properly it probably means that you made an error while configuring the Environment Variables. Subversion is a code version tool that allows multiple programmers to work on a project at the same time. Typically whoever is in charge of the project looks over the various code versions, the commits the best version to the "trunk" or main version of the application. If you see people talking about the Red5 "trunk", it means it is the main working version of the code. We need subversion installed in order to get the latest main working version of the Red5 code. If you get a binary version of subversion that doesn't have an installer, make sure to add it to your Environment Variables so that it can be accessed from the command line. There are various ways of getting subversion and I am not going to cover them in this tutorial, I hope not to your detriment. When you run the command, you should see a list of files scroll down the screen as they are downloaded. 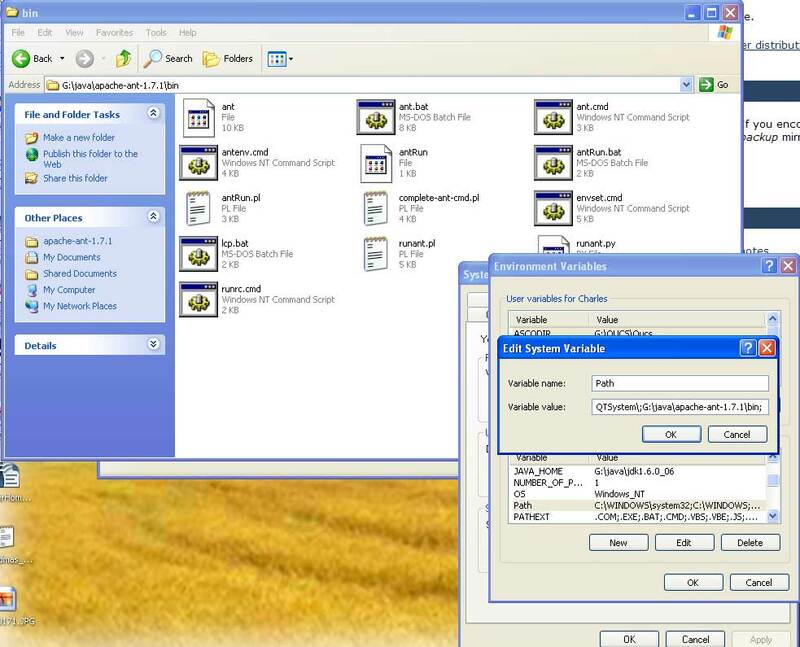 You'll also notice the folder you ran the above command in start to become populated with files and directories. Assuming all of the previous steps have worked, you are first entitled to a bit of congratulations. Now we get to move onto the fun stuff. Open a command prompt and change directories to the folder that you just used svn to download all of the code into. You should see in the base red5 directory a file called "build.xml". This is the Ant build script for compiling Red5. and you will see the build process start. You should see a large list of Google dependencies scroll by, some of which may be downloaded on the spot. 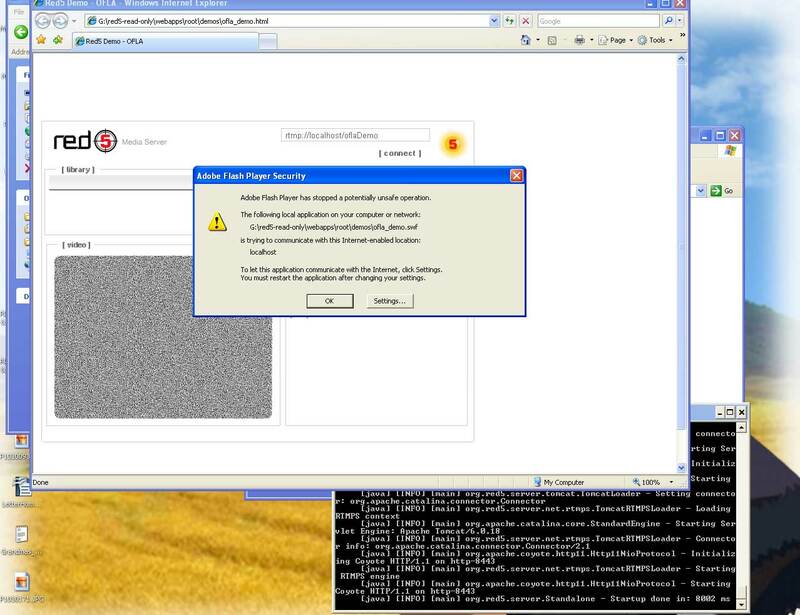 During this process you may get firewall prompts from Java. Allow exceptions in your firewall. If all goes well you will continue to see things fly by in the console window until all the output stops and the last prompt will read. "Startup done in ", then it lists the milliseconds. As long as you leave this command prompt window open, Red5 will be running. When the installer first opens, just click on "Connect". The installer should connect and list all of the demo applications available. I would suggest that you install oflaDemo by simply highlighting its name and clicking Install. After the installation, if you look in the red5 install folder/webapps/ you should notice that a new folder "oflaDemo" has been created. The webapps folder is where all of the source code for Red5 applications is placed. When we run the ant build process, applications are compiled and copied from webapps to the dist folder. you may get a Flash Player Security settings dialog that wont allow you to connect to localhost. If this occurs, then you have to go to the online Flash Player Global Security Settings panel and allow permissions to connect to your local red5 directory. If you are able to connect to the oflaDemo application, you should see the red5 console window acknowledge a connection then see a list of movie trailers you can stream. Click on a trailer name to stream it. Below I will list a few of the common errors I have seen recently and provide links to resources about fixing them. If none of these work for you, then please just be patient and stick with it. Red5 is a really fun tool to work with once you know how it works. 1. When trying to run the demo applications, you cant connect and the console window says "Closing RTMPMinaConnection from 127.0.0.1: to localhost with id ##### due to long handshake"
If you get the above error, its likely that you haven't installed the server instance of the demo application you are trying to connect to! Make sure you have used the installer to install the specific application you are trying to demo. Although the demos page lists and has all of the flash programs for the samples, the server doesn't come pre-installed with them if you download the source code version. 2. When trying to run the command "ant server" for the first time, you have problems with the googlecode dependencies and the build process fails. which should make you start downloading .jar files again. I think this mainly happens when you have run previous versions of Red5 in the past on the same machine. 3. When trying to run any "ant" commands, you get the message ANT_HOME is set incorrectly or ant could not be located. Please set ANT_HOME. In this instance it means you have installed java correctly, but ant isnt setup correctly. Make sure you set both the ANT_HOME environment variable and also added the path to ant's bin folder to your system path. I haven't ever dealt with the authdemo specifically, but another great place to look that might help you find the issue is in the red5 logs folder. Besides the main logs there are usually application specific logs. I don't have experience with the eclipse plugin, but if you start the server using batch scripts it used to print out the applications it has loaded as it loads them in the terminal. If you redirect the terminal output to a file temporarily, it might help too. To do this on a windows host in a command prompt open in the same folder as red5.bat you would do something similar to this. Then after you wait a while for the startup procedure to finish, you would have to kill the process with control + c in the command window. Since a couple of days I'm trying to get the red5 authdemo to work (in Eclipse Juno on OS X 10.7.2). Is it possible that I haven't installed the authdemo application correctly? In this case... how do I have to install a server instance? Is there a way to check if authdemo works correctly? I appreciate every kind of help! Hi, I have installed red5 & started it . But when i try to install demos (http://localhost:5080/installer/) , it shows me "connecting..." & never ends . I have net connection Ok . Whats the problem ? please help me . I have installed latest : "Red5-1.0.0-RC2.exe" & jdk version 7 : "jdk-7u7-windows-i586.exe"
Thanks Twisty, Im glad you got it working! Just FYI - you dont need ant for any of the versions of Red5 if all you want to do is run it. However if you want to re-build it from source code or build server side applications, youll need ant. My hosting company is a semi-managed hosting and I had the install red5 for me and they did then they came back and told me I need to configure the red5 to my requirements. I have no idea on how to do this I have messed up the server about 8 times and lost all my data and they had to reinstall the os for me over a months time. So Can anyone help me getting this configured so I can use it and I do not have to pay a red5 hosting company? When you compile the server using ant, a dist folder is created, then the server is run out of that directory. I'd make sure your RED5_HOME environment variable is set to the right location. 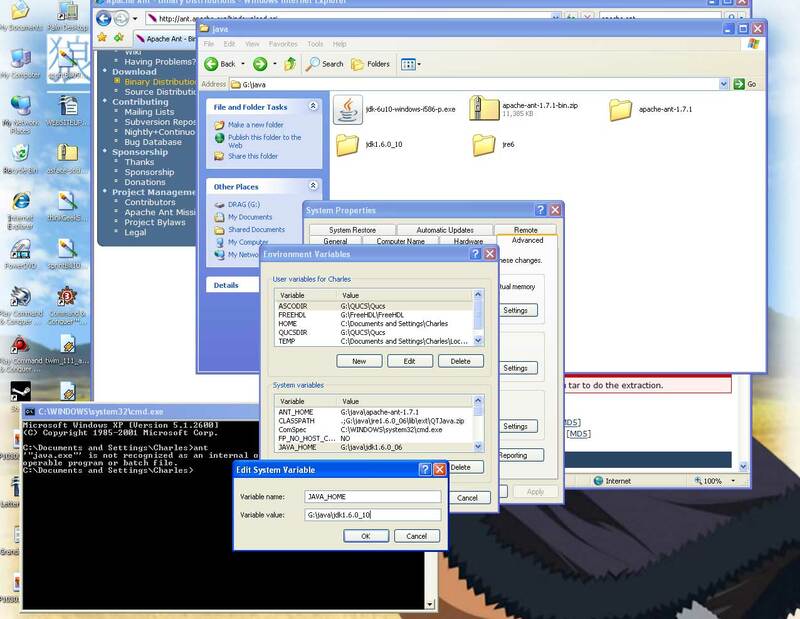 Also make sure if using Windows Vista+ that the UAC isn't preventing ant from creating directories. 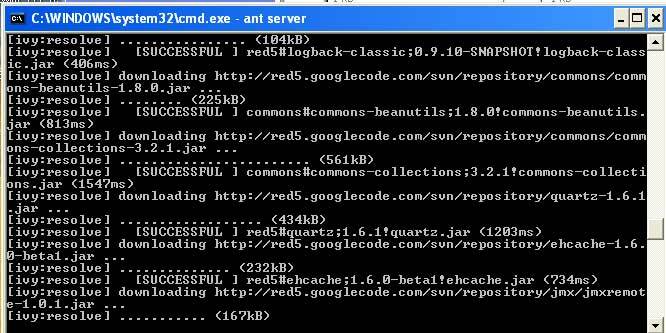 After compiling red server using ant server command.I am getting the following. [copy] Warning: C:\Program Files\flash\trunk\deploy does not exist. Awesome tutorial! I have a smooth installation by the way!! Have you checked out the Google groups Red5 group and mailing list? There has been a lot of activity lately regarding mp4 files. i have installed red5 server, it is running flv files, but not running mp4 and 3gp files. it does not give any error too. Anybody got idea about this. By default ofla demo awlays loads with localhost in the connection string box. You need to manually type in any other IP address. Everything works fine. when i click on connect from oflaDemo it gives me following error. the problem is it still shows rtmp://localhost/oflaDemo, and i think it should have shown 192.268.248.128 which is the server in this case. Hi again Chris. 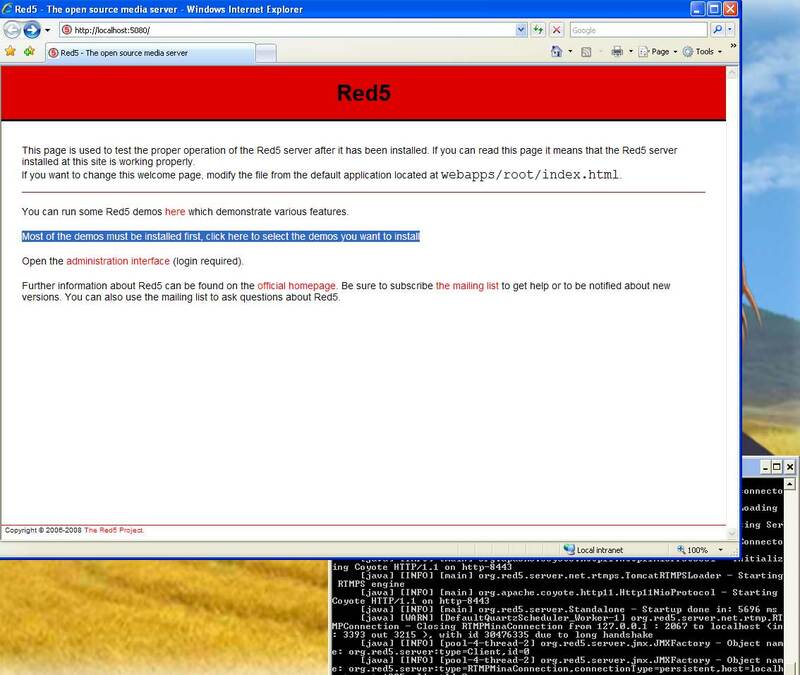 When red5 runs, it uses the tomcat http server to run a webpage that can be opened in a browser on port 5080. If you are trying to connect to red5 using an actual flash application even running inside a webpage the syntax is a bit different. Let's assume I have used the installer application on red5 to install the classic oflaDemo application. In order to connect to that in a flash application, assuming the server is running locally, the syntax would be: rtmp://localhost/oflaDemo. The rtmp protocol uses port 1935 by default (I think), so make sure local apps can connect to it. Red5 is hard to use, but hopefully this will help you out. Well, I got red5 to run using command prompt and the last line says "Bootstrap complete". But can you direct me on how to run my client app. I'm using Eclipse IDE with the FlashBuilder plugin and when I try to run the Actionscript, an HTML page opens but its empty and doesn't seem to connect to my localhost:5080. I'm a red5 newbie so I'm not sure how to get my client running or if I'm missing a step in the deployment process. If you used one of the installers to install Red5 you don't need to use ant to re-build it. Ant is only when you're building the server from its source code when you are making server-side applications. If you want to try and manually start Red5 on windows when it is already built, there is usually a red5.bat batch script you can just double click on, and it will start the server. The installers normally install red5 as a service too. Not sure about the latest builds though. 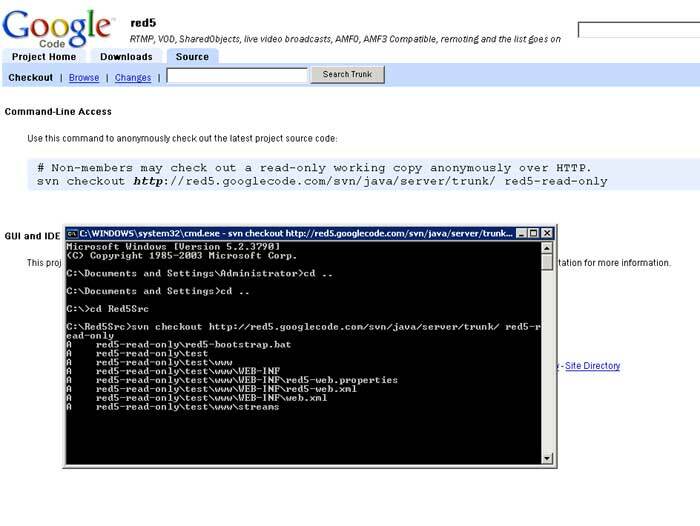 Every time I try to test Red5, I type http://localhost:5080/ but the page tells me that I could not connect to localhost:5080. I know that Red5 is running and this is the output I'm getting in command prompt. I'm getting confused on the last part of the tutorial on how to install a demo for further testing. Can anyone help? Hi lsharma. There is already a decently mature project project called red5phone that does exactly what you're looking for. If your looking for skype like performance, I would suggest taking a look at the XMPP protocol instead with its libjingle extensions that implement actual SIP and more standardized protocols. You'll likely need to create a flash client side application to stream the live video. On the Red5 server side, the demo application oflaDemo can actually be used for the streaming. 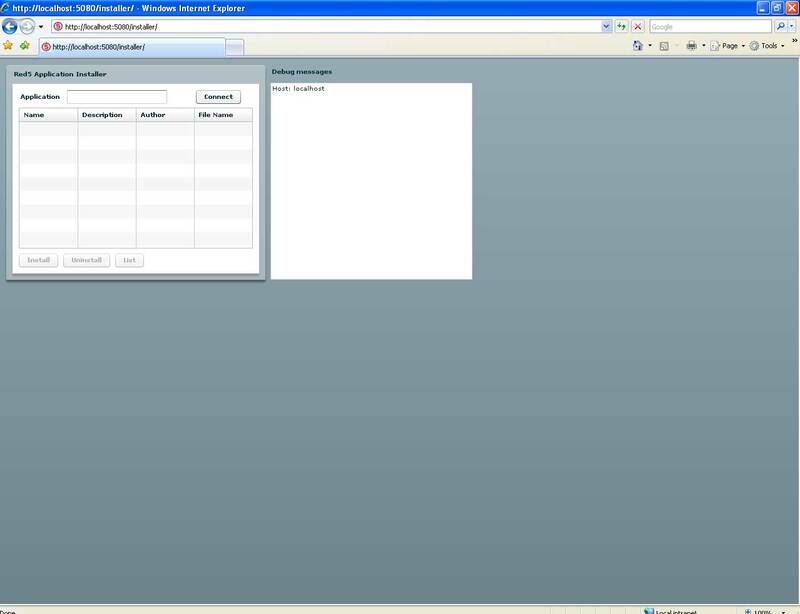 There are two really old Flash demos with Red5 called Simple Broadcaster and Simple Subscriber (You have to use the application installer to install them) that will do exactly what you are talking about. If you want example code, you can use my Red5 Tuning application as a start that will broadcast and receive live streams from Red5. It's written in Flex. can you tell me how can I make a simple webcam broadcasting app using flash and red5? I need something that can show my webcam to a user on internet. Thank you very much. Its very helpful to setup Red5 in my system. You must have something already running on port 8080. On the command line of any Windows, Linux, or Mac machine you should be able to use the command "netstat -a -b" to see all of the binaries that are occupying your system's ports. conf/red5.properties . Under the HTTP section, you can change the port. when i run project in eclipse it gives error of port in use 5080. how can i stop port i stop red 5 services manually i stop through red5-shutdown bat but it gives same error all the time 5080 port is in use so what to do.... ? Sorry to hear you are very frustrated. Being frustrated and understanding Red5 go hand in hand. The best resource I have seen lately are the videos on red5guide.com. I didn't watch all of them, but I think she assumes your using Eclipse, which I never do. 1. the tutorials available on net are of old version of red5. so please if any one have latest tutorial link do send me. 2. when i create application it gives errors that build path is incomplete and it gives error on imports. as commons-logging file i'v download it but now it give errors there is no file or package is there in new version as mentioned in most of tutorials specialy it gives error in logging file. Will you please help me modify and run java examples? Sorry that didn't help JaV. 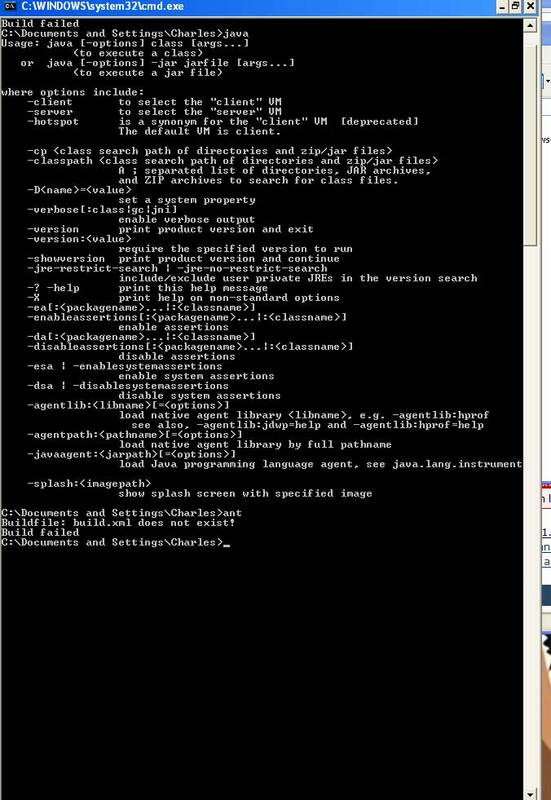 If you use "ant clean" it will delete all the compiled stuff and completely recompile everything. They try "ant server". Something I often do when I am making modifications to build.xml is to run "ant server > startuplog.txt" and then wait a while, run the commands that screw something up. They when you kill the server you will have the entire output of the startup sequence in the text file. Hi Charles, thanks for ur help but im still stuck. Its when im on http://localhost:5080/installer/, i click to install a sample, and it just hangs. I think the issue is caused by the build going wrong in step 8. I dont seem to be able to build it properly and i think that is causing trouble. If anyone can help i would really appreciate it. I am in desperate need of a working red5 server. Hi JaV. In the Red5 root directory, take a look inside the dist folder. All applications before they run using this method should end up in the dist folder. Do you think it could be a permissions problem? Also, doesn't the command prompt show the URLs from where the applications are being downloaded from as its happening? Its possible that when you tried this, the server they are hosted on is having some difficulty? Hi. I got through most of the setup, but at step 8 i got a build error. I had to type in ant ivyclear retrieve to get a successful build (I found this line on another site). This works, but when i get to step 10 and try to install demos, they start but never finish. It should only takes minutes but it never finishes for me so I assume there's a problem. Could you please help if u can coz i cant find any answers. T-H-A-N-K...UUUU 4-this posting!!! I am new to this stuff and your help has been INVALUABLE! Really appreciate you taking the time and having the heart to make my life ez! Nice tutorial! I was actually a bit confused by the normal Red5 docs, but this got me off the ground. Thanks! Nice work - all works for me as of June 09 with latest trunk source (0.8).